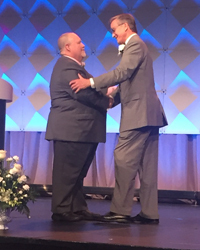 Last week, during the APTA Awards and honors ceremony, – two Illinois members were recognized for their service and professional excellence. The Catherine Worthingham Fellows of the American Physical Therapy Association (FAPTA) designation is the highest honor among APTA’s membership categories. James M. Elliott, PT, PhD, FAPTA joins the rank of the honored few who are recognized for their leadership, influence, and achievements in the profession for more than 15 years. Peter J. McMenamin, PT, DPT, MS Board‐Certified Clinical Specialist in Orthopaedic Physical Therapy was honored with the Lucy Blair Service Award. This award is presented to members whose contributions on appointed or elected positions within the association and state chapter are of exceptional quality. Peter’s commitment is visible throughout the many vital roles Peter has held with the Illinois Physical Therapy Association, including serving as Chapter President. Nominations for the 2019 Honors and Awards Program will open September 2018.